Why do I need Lipoparticles for antibody immunization and screening? 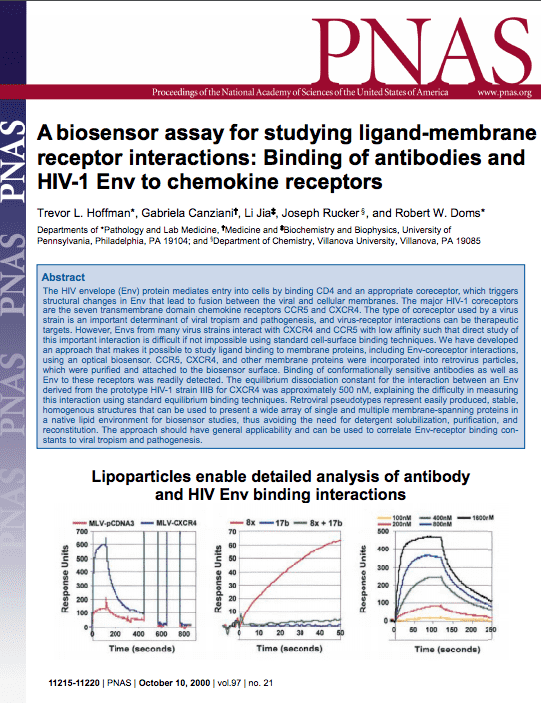 Why are Lipoparticles so effective for antibody discovery? "For my custom Lipoparticle project I really appreciated that Integral Molecular was not satisfied with average quality." The team did all they could do to meet our expectations and they succeeded." How can I buy Lipoparticles? Lipoparticles are typically customized to incorporate customers’ specified membrane proteins. Each Lipoparticle batch is assessed using up to 16 quality-control metrics to ensure homogeneity, purity, and target protein integrity. 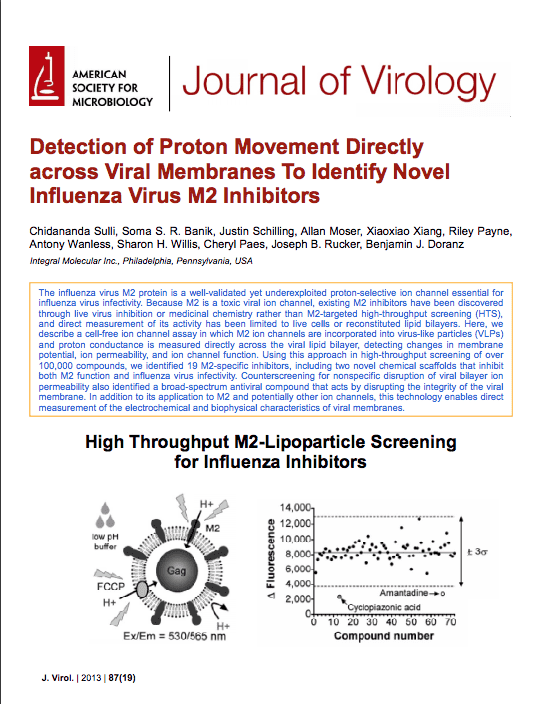 Hundreds of membrane proteins have been successfully incorporated into Lipoparticles, which can be modified with biotin or fluorescence for detection. Prevalidated Lipoparticles contain optimized, highly expressed membrane proteins and are available for rapid delivery. 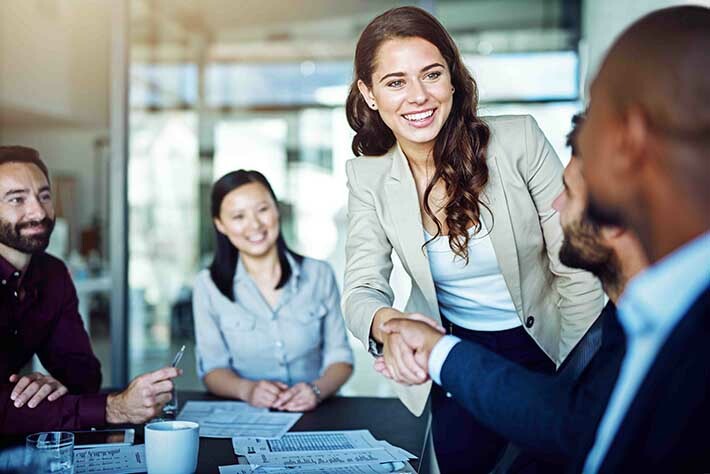 ReadyReceptor Lipoparticles are produced and validated using the same stringent quality metrics as are used for our Custom Lipoparticle production. Lipoparticle sample kits containing CXCR4, CCR5 or CD20 are available for overnight delivery to enable application optimization and small-scale testing. Lipoparticles can be modified with (B) Biotin or (F) Fluorescence. "Integral Molecular is the only source available for full length CXCR4 protein for ligand binding assays. Both human and mouse CXCR4 Lipoparticles are available, which was essential for the preclinical project that I was working on." 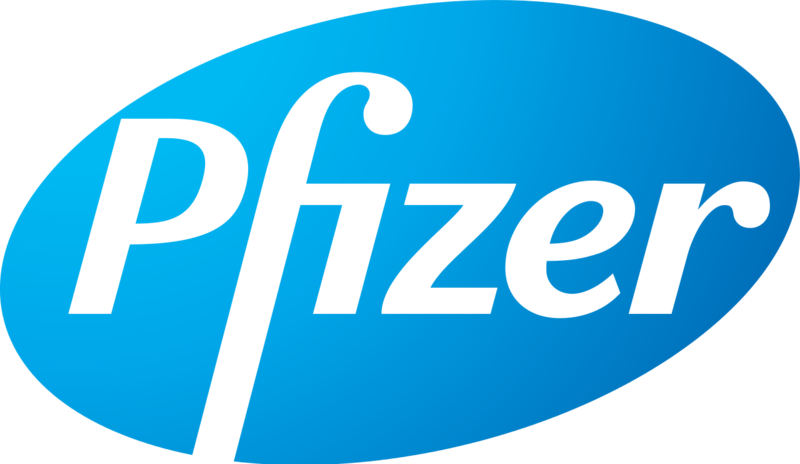 "The customer service is great and there are a wide variety of membrane proteins." 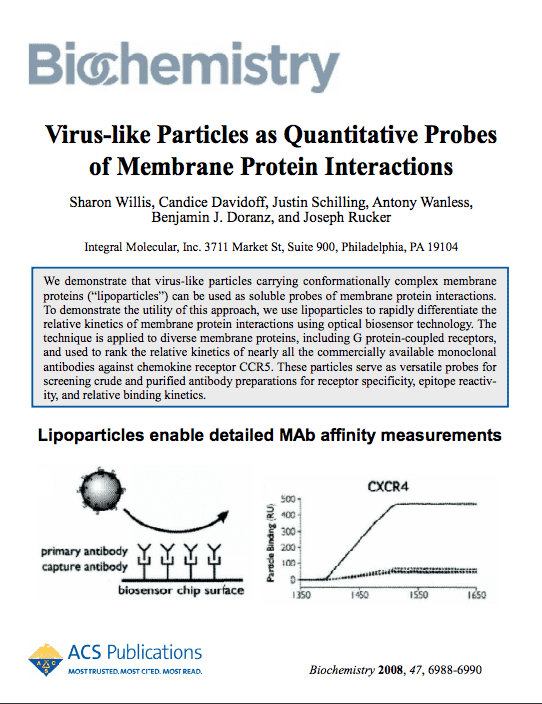 Lipoparticles are noninfectious virus-like particles (VLPs) containing high concentrations of specific membrane proteins in their native conformation. 2What is a Lipoparticle Unit? A Lipoparticle Unit correlates with the number of Lipoparticles in solution. One Unit is enough to obtain a strong ELISA response from 1 well of a 96-well plate. Lipoparticles are normalized by Dynamic Light Scattering (DLS). The DLS intensity is proportional to the number of Lipoparticles in solution. 3Are target membrane proteins on Lipoparticles conformationally intact? Yes. Target membrane proteins are conformationally intact because they are incorporated onto the Lipoparticle surface directly from the cell surface and are never extracted, detergent solubilized, or refolded. 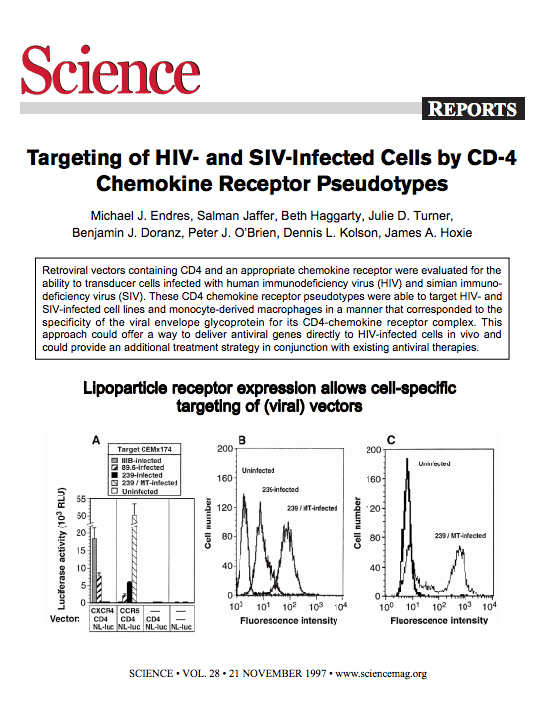 Lipoparticles are usually produced from human cell lines, so receptors also contain native post-translational modifications. Conformational integrity is confirmed by binding to conformation-dependent antibodies or ligands, depending on the receptor and available reagents. 4Can complexes of multiple membrane proteins (e.g., two or more) be incorporated? Yes, two or more membrane proteins can be incorporated simultaneously while maintaining their association as multiprotein complexes. Lipoparticle stability is comparable to the stability of other purified proteins. Lipoparticles are stable for at least 2 years when refrigerated or frozen (-80° C). Like most lipid structures, Lipoparticles will be disrupted by detergents. Lipoparticle suspensions will appear as an opaque solution and should be gently mixed before use. Excessive vortexing, dilution, and filtration of Lipoparticles should be avoided to minimize sample loss. 6Can Lipoparticles be labeled or modified? Lipoparticles are nonliving biochemical reagents and can readily be modified during the production and purification process. Lipoparticles are available from Integral Molecular as biotinylated or fluorescently labeled molecules. 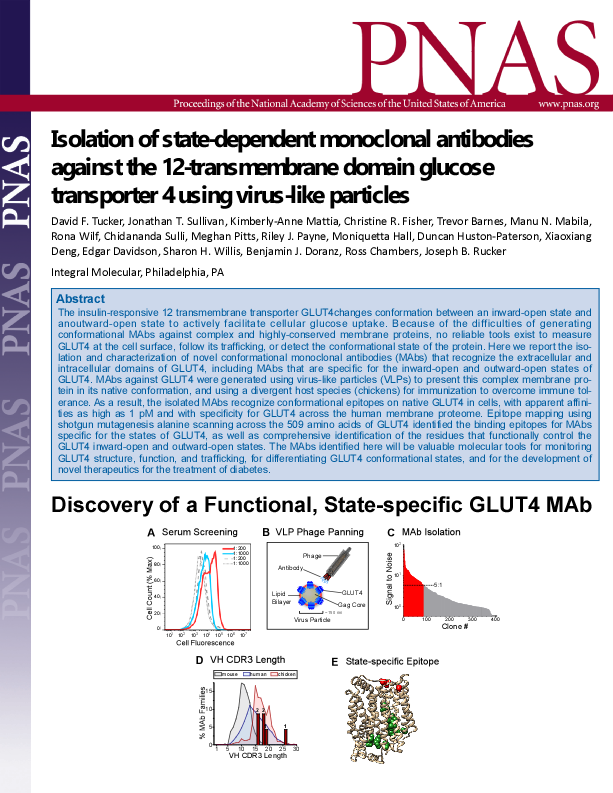 7Do Lipoparticles contain nonspecific membrane proteins? Lipoparticles bud from the cell surface, so they contain specific membrane proteins of interest as well as additional membrane proteins from the cells that are used for production. 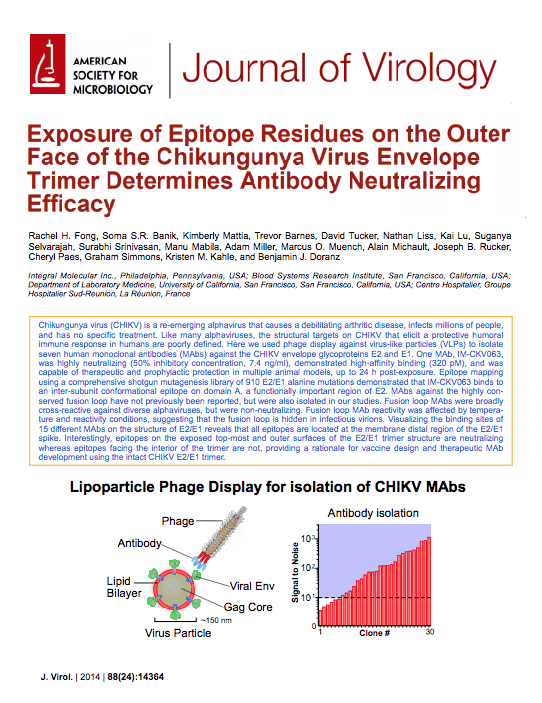 The effects of these nonspecific membrane proteins are minimized by the overexpression of the membrane protein of interest, the use of alternative cell types where necessary, and the use of Null Lipoparticles that do not contain the membrane protein of interest as negative controls.